PNNL: What Perturbs a Group of Microbes? What Perturbs a Group of Microbes? To determine how changes in the environment could affect the use of microbes in advanced industrial processes, researchers applied the innovative approach of integrated omics. 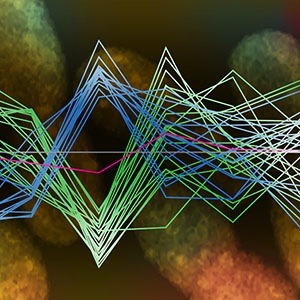 Omics are a group of techniques, including genomics, proteomics, and metabolomics, often used to explore the functions, relationships, and activities that make up the cells in an organism. This study is one of the first times the approach has been applied to a community of microbes.Enlarge Image. Results: The future of industry may involve using microbes to generate energy or process chemicals. But how will these microbes respond when they are grouped into communities in an industrial setting? A team of scientists from Pacific Northwest National Laboratory (PNNL) and Washington State University (WSU) Tri-Cities began to answer that question by determining how an environmental change, such as a different pH level, affected a community of microbes. The study is described in FEMS Microbiology Ecology. Why It Matters: Much research has focused on understanding specific types of microorganisms and how they might be used in industry. However, many advanced industrial processes will require groups of microorganisms working together. "Understanding a community on a small scale can help scientists model how that community will behave in industrial settings," said Dr. Amy Boaro, of PNNL and WSU-Tri-Cities, who performed the experiments as part of her dissertation work. "Our studies can also help predict how communities will respond to perturbations like changes in temperature or pH so we can better prepare to use these communities in industrial processes." Methods: The scientists applied an innovative approach of integrated omics, a group of techniques including genomics (study of genes), proteomics (study of proteins), and metabolomics (study of metabolites) that often are used to explore the functions, relationships, and activities making up the cells in an organism. Applying integrated omics or "pan-omics" to a single organism can result in a massive amount of data to the point where it becomes difficult to separate the wheat from the chaff. Applying the approach to an entire community was even more challenging. To test their approach, scientists used a simplified version of the microbial community that lives in the largest compartment of a cow's stomach. That community was of particular interest because it is capable of turning some of the most abundant biomass on the planet-cellulose-into energy. Using a bioreactor in a laboratory, the team altered the pH of the microbial community. Then, they used cutting-edge omics techniques to monitor changes in community function and determine which parts were affected by the pH change, how the altered pH affected cellulose-processing tasks, and how long it took for the community to return to normal functioning. What's Next? Scientists hope to scale up from the laboratory experiments to a more complex community that would more accurately reflect industrial applications. Lessons learned for this effort could inform development of a variety of biotechnology applications, such as biofuel generation. Sponsors: Research described in this study was partly funded by PNNL's Microbial Communities Initiative and the U.S. Department of Energy's (DOE) Office of Science, Biological and Environmental Research Genomic Science Program through the Pan-omics Program. Experiments were performed at the Environmental Molecular Sciences Laboratory (EMSL), a DOE Office of Biological and Environmental Research-sponsored national scientific user facility located on the PNNL campus, and the Bioproducts, Sciences, and Engineering Laboratory (BSEL), located on the WSU Tri-Cities campus. Reference: Boaro AA, Y-M Kim, AE Konopka, SJ Callister, and BK Ahring. 2014. "Integrated ‘Omics Analysis for Studying the Microbial Community Response to a pH Perturbation of a Cellulose-Degrading Bioreactor Culture." FEMS Microbiology Ecology 90(3):802-815. DOI: 10.1111/1574-6941.12435. Research Team: Amy Boaro and Birgitte Ahring, Bioproducts, Sciences, and Engineering Laboratory, WSU Tri-Cities; and Young-Mo Kim, Allan Konopka, and Stephen Callister, PNNL. Boaro also is an intern at PNNL.